This is the latest accepted revision, reviewed on 8 March 2019. For other uses, see Trebuchet (disambiguation). A trebuchet[nb 1] (French trébuchet) is a type of catapult, a common and powerful type of siege engine which uses a swinging arm to throw a projectile. The traction trebuchet, also referred to as a mangonel at times, first appeared in Ancient China during the 4th century BC as a siege weapon. It spread westward, probably by the Avars, and was adopted by the Byzantines in the mid 6th century AD. It uses manpower to swing the arm. The later counterweight trebuchet, also known as the counterpoise trebuchet, uses a counterweight to swing the arm. It appeared in both Christian and Muslim lands around the Mediterranean in the 12th century, and made its way back to China via Mongol conquests in the 13th century. The trebuchet is a compound machine that makes use of the mechanical advantage of a lever to throw a projectile. They are typically large constructions (up to 30 meters (100 ft) in height or more) made primarily of wood, usually reinforced with metal, leather, rope, and other materials. They are usually immobile and must be assembled on-site, possibly making use of local lumber with only key parts brought with the army to the site of the siege or battle. A trebuchet consists primarily of a long beam attached by an axle suspended high above the ground by a stout frame and base, such that the beam can rotate vertically through a wide arc (typically over 180°). A sling is attached to one end of the beam to hold the projectile. The projectile is thrown when the beam is quickly rotated by applying force to the opposite end of the beam. The mechanical advantage is primarily obtained by having the projectile end of the beam much longer than the opposite end where the force is applied – usually four to six times longer. Counterweight trebuchets are powered by gravity; potential energy is stored by slowly raising an extremely heavy box (typically filled with stones, sand, or lead) attached by a hinged connection to the shorter end of the beam, and releasing it on command. Traction trebuchets are human powered; on command, men pull ropes attached to the shorter end of the trebuchet beam. The difficulties of coordinating the pull of many men together repeatedly and predictably makes counterweight trebuchets preferable for the larger machines, though they are more complicated to engineer. Further increasing their complexity is that either winches or treadwheels, aided by block and tackle, are typically required to raise the more massive counterweights. So while counterweight trebuchets require significantly fewer men to operate than traction trebuchets, they require significantly more time to reload. In a long siege, reload time may not be a critical concern. When the trebuchet is loosed, the force causes rotational acceleration of the beam around the axle (the fulcrum of the lever). These factors multiply the acceleration transmitted to the throwing portion of the beam and its attached sling. The sling starts rotating with the beam, but rotates farther (typically about 360°) and therefore faster, transmitting this increased speed to the projectile. The length of the sling increases the mechanical advantage, and also changes the trajectory so that, at the time of release from the sling, the projectile is traveling in the desired speed and angle to give it the range to hit the target. Adjusting the sling's release point is the primary means of fine-tuning the range, as the rest of the trebuchet's actions are difficult to adjust after construction. The rotation speed of the throwing beam increases smoothly until it reaches maximum rotation speed. Then the arm continues to rotate, slowing, coming to rest at the end of the rotation rather smoothly as momentum is transferred to the sling and its projectile. This is unlike the violent sudden stop inherent in the action of other siege engine designs such as the onager, which loses energy thereby. This key difference also makes the trebuchet much more durable, allowing for larger and more powerful machines. A trebuchet projectile can be almost anything, even debris, corpses, or incendiaries, but is typically a large stone. Dense stone, or even metal, specially worked to be round and smooth, gives the best range and predictability. When attempting to breach enemy walls, it is important to use materials that will not shatter on impact; projectiles were sometimes brought from distant quarries to get the desired properties. Wheeled whirlwind traction trebuchet from the Wujing Zongyao. The traction trebuchet, also referred to as a mangonel in some sources, is thought to have originated in ancient China. Torsion-based siege weapons such as the ballista and onager are not known to have been used in China. The first recorded use of traction trebuchets was in ancient China. They were probably used by the Mohists as early as 4th century BC, descriptions of which can be found in the Mojing (compiled in the 4th century BC). In Chapter 14 of the Mojing, the traction trebuchet is described hurling hollowed out logs filled with burning charcoal at enemy troops. The trebuchet was carried westward by the Avars and appeared next in the eastern Mediterranean by the late 6th century AD, where it replaced torsion powered siege engines such as the ballista and onager due to its simpler design and faster rate of fire. The Byzantines adopted the traction trebuchet possibly as early as 587, the Persians in the early 7th century, and the Arabs in the second half of the 7th century. The Franks and Saxons adopted the weapon in the 8th century. The catapult, the account of which has been translated from the Greek several times, was quadrangular, with a wide base but narrowing towards the top, using large iron rollers to which were fixed timber beams "similar to the beams of big houses", having at the back a sling, and at the front thick cables, enabling the arm to be raised and lowered, and which threw "enormous blocks into the air with a terrifying noise". West of China, the traction trebuchet remained the primary siege weapon until the 12th century when it was replaced by the counterweight trebuchet. In China the traction trebuchet continued to be used until the counterweight trebuchet was introduced during the Mongol conquest of the Song dynasty. 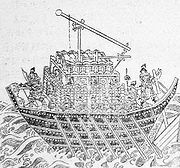 In 617 Li Mi (Sui dynasty) constructed 300 trebuchets for his assault on Luoyang, in 621 Li Shimin did the same at Luoyang, and onward into the Song dynasty when in 1161, trebuchets operated by Song dynasty soldiers fired bombs of lime and sulphur against the ships of the Jin dynasty navy during the Battle of Caishi. The term "traction trebuchet" is a modern invention and was not used by contemporary users of the weapon. 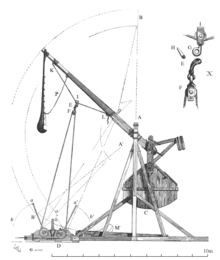 The term was created mainly to distinguish it from the onager, a torsion powered artillery weapon which is often confused with another name for the traction trebuchet, the mangonel, a generic medieval term for stone throwing artillery. Confusion between the onager and mangonel in terminology has led some historians today to use traction trebuchet instead. The mangonel is called al-manjanīq in Arabic. In China the traction trebuchet was called the pào (砲). The hand-trebuchet (Greek: cheiromangana) was a staff sling mounted on a pole using a lever mechanism to propel projectiles. Basically a one-man traction trebuchet, it was used by emperor Nikephoros II Phokas around 965 to disrupt enemy formations in the open field. It was also mentioned in the Taktika of general Nikephoros Ouranos (c. 1000), and listed in De obsidione toleranda (author anonymous) as a form of artillery. According to Paul E. Chevedden, a hybrid trebuchet existed that used both counterweight and human propulsion. However no illustrations or descriptions of the device exist from the time when they were supposed to have been used. The entire argument for the existence of hybrid trebuchets rests on accounts of increasingly more effective siege weapons. Peter Purton suggests that this was simply because the machines became larger. The earliest depiction of a hybrid trebuchet is dated to 1462, when trebuchets had already become obsolete due to cannons. The earliest known description and illustration of a counterweight trebuchet comes from a commentary on the conquests of Saladin by Mardi ibn Ali al-Tarsusi in 1187. The earliest solid reference to counterweight trebuchets in European sources dates to the siege of Castelnuovo Bocca d'Adda in 1199. They were used in Germany from around 1205, in England at least by 1217, and in Iberia shortly after 1218. By the 1230s the counterweight trebuchet was a common item in siege warfare. Paul E. Chevedden argues that counterweight trebuchets appeared even earlier in Europe based on what might have been counterweight trebuchets in earlier sources. The 12th century Byzantine historian Niketas Choniates may have been referring to a counterweight trebuchet when he described one equipped with a windlass, which is only useful to counterweight machines, at the siege of Zevgminon in 1165. At the Siege of Nicaea in 1097 the Byzantine emperor Alexios I Komnenos reportedly invented new pieces of heavy artillery which deviated from the conventional design and made a deep impression on everyone. 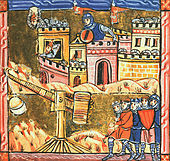 Possible references to counterweight trebuchets also appear for the second siege of Tyre in 1124, where the crusaders reportedly made use of "great trebuchets". 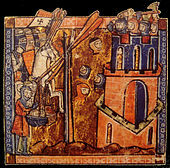 Chevedden argues that given the references to new and better trebuchets that by the 1120–30s, the counterweight trebuchet was being used in a variety of places by different peoples such as the crusader states, the Normans of Sicily and the Seljuks. Counterweight trebuchets do not appear with certainty in Chinese historical records until about 1268 when the Mongols laid siege to Fancheng and Xiangyang. After failing to take the twin cities of Fancheng and Xiangyang for several years, collectively known as the Siege of Fancheng and Xiangyang, the Mongol army brought in two Persian engineers to build hinged counterweight trebuchets. Known as the Huihui trebuchet (回回砲, where "huihui" is a loose slang referring to any Muslims), or Xiangyang trebuchet (襄陽砲) because they were first encountered in that battle. Ismail and Al-aud-Din arrived travelled to South China from Iraq and mangonels and trebuchets for the siege. Chinese and Muslim engineers operated artillery and siege engines for the Mongol armies. The counterweight trebuchet, known as the Muslim trebuchet in China, replaced the traction version after its introduction in the late 13th century. Its greater range was however, somewhat countered by the fact that it had to be constructed close to the site of the siege unlike traction trebuchets, which were easier to take apart and put back together again where necessary. The counterweight trebuchet remained in use in China for roughly two centuries, at which point it was well on its way to obsolescence. The couillard is a smaller version of a counterweight trebuchet with a single frame instead of the usual double "A" frames. The counterweight is split into two halves to avoid hitting the center frame. With the introduction of gunpowder, the trebuchet began to lose its place as the siege engine of choice to the cannon. Trebuchets were still used both at the siege of Burgos (1475–1476) and siege of Rhodes (1480). One of the last recorded military uses was by Hernán Cortés, at the 1521 siege of the Aztec capital Tenochtitlán. Accounts of the attack note that its use was motivated by the limited supply of gunpowder. The attempt was reportedly unsuccessful: the first projectile landed on the trebuchet itself, destroying it. Most trebuchet use in recent centuries has been for recreational or educational, rather than military purposes. New machines have been constructed and old ones restored by living history enthusiasts, for historical re-enactments, and use in other historical celebrations. As their construction is substantially simpler than modern weapons, trebuchets also serve as the object of engineering challenges. The trebuchet's technical constructions were lost at the beginning of the 16th century. In 1984, the French engineer Renaud Beffeyte made the first modern reconstruction of a trebuchet, based on documents from 1324. The largest currently-functioning trebuchet in the world is the 22-tonne machine at Warwick Castle, England, constructed in 2005. Based on historical designs, it stands 18 metres (59 ft) tall and throws missiles typically 36 kg (80 lbs) up to 300 metres (980 ft). The trebuchet gained significant interest from numerous news sources when in 2015 a burning missile fired from the siege engine struck and damaged a Victorian-era boathouse situated at the River Avon close by, inadvertently demonstrating the weapon's power. It is built on the design of a similar trebuchet at Middelaldercentret in Denmark. In 1989, Middelaldercentret became the first place in the modern era to have a working trebuchet. Trebuchets compete in one of the classifications of machines used to hurl pumpkins at the annual pumpkin chucking contest held in Sussex County, Delaware, U.S. The record-holder in that contest for trebuchets is the Yankee Siege II from New Hampshire, which at the 2013 WCPC Championship tossed a pumpkin 2835.8 ft (864.35 metres). The 51-foot-tall (16 m), 55,000-pound (25,000 kg) trebuchet flings the standard 8–10-pound (3.6–4.5 kg) pumpkins, specified for all entries in the WCPC competition. A large trebuchet has recently been tested in Belfast as part of the set for the television series Game of Thrones. A large trebuchet based on Edward I's "Warwolf" was constructed for a scene in David Mackenzie's movie Outlaw King about Robert the Bruce, King of Scots. During the film, it hurls an incendiary projectile at Stirling Castle. It recreates the true story that it took some three months to build, and Edward I "Longshanks" would not let his enemy surrender until he could use it. 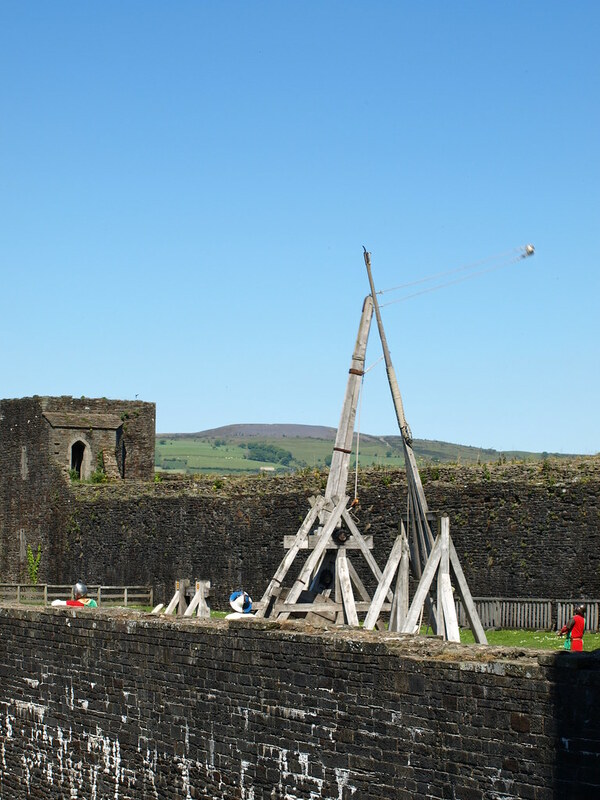 Although rarely used as a weapon today, trebuchets maintain the interest of professional and hobbyist engineers. One modern technological development, especially for the competitive pumpkin-hurling events, is the "floating arms" design. Instead of using the traditional axle fixed to a frame, these devices are mounted on wheels that roll on a track parallel to the ground, with a counterweight that falls directly downward upon release, allowing for greater efficiency by increasing the proportion of energy transferred to the projectile. In 2013, during the Syrian civil war, rebels were filmed using a trebuchet in the Battle of Aleppo. The trebuchet was used to project explosives at government troops. In 2014, during the Hrushevskoho street riots in Ukraine, rioters used an improvised trebuchet to throw bricks and molotov cocktails at the Berkut. Trebuchet constructed on the design of the "Warwolf"
^ Janin 2014, p. 41. ^ Saimre 2007, p. 65. ^ Saimre 2007, p. 64. ^ Saimre 2007, p. 73. ^ a b Chevedden, Paul E.; et al. (July 1995). "The Trebuchet". Scientific American: 66–71. Original version. ^ a b The Trebuchet, Citation: "The trebuchet, invented in China between the fifth and third centuries B.C.E., reached the Mediterranean by the sixth century C.E. " ^ a b Graff 2016, p. 86. ^ Purton 2009, p. 366. ^ Graff 2016, p. 141. ^ Purton 2009, p. 367. ^ Purton 2009, p. 30. ^ Purton 2009, p. 29. ^ Needham, Joseph (1987). Science and Civilisation in China: Military technology: The Gunpowder Epic, Volume 5, Part 7. Cambridge University Press. p. 166. ISBN 978-0-521-30358-3. ^ Franke, Herbert (1994). Denis C. Twitchett; Herbert Franke; John King Fairbank (eds.). The Cambridge History of China: Volume 6, Alien Regimes and Border States, 710–1368. Cambridge University Press. pp. 241–242. ISBN 978-0-521-24331-5. ^ Purton 2009, p. 365. ^ Purton 2009, p. 410. ^ Purton 2009, p. 411. ^ Purton 2009, p. 382. ^ Bradbury, Jim (1992). The Medieval Siege. The Boydell Press. ISBN 978-0-85115-312-4. ^ "Arms and Men: The Trebuchet". Historynet.com. Retrieved 2016-08-29. ^ Purton 2009, p. 387. ^ Chevedden 2000, pp. 76–86; 110f. ^ Chevedden 2000, pp. 104f. ^ Jasper Becker (2008). City of heavenly tranquility: Beijing in the history of China (illustrated ed.). Oxford University Press. p. 64. ISBN 978-0195309973. Retrieved 2010-10-28. ^ René Grousset (1970). The Empire of the Steppes: A History of Central Asia (reprint ed.). Rutgers University Press. p. 283. ISBN 978-0813513041. Retrieved 2010-10-28. ^ Turnbull 2001, p. 33. ^ Turnbull 2001, p. 36. ^ Max (19 May 2015). "Trebuchet Design Factors". Archived from the original on 4 June 2015. ^ Ramsey, Syed (2016-05-12). Tools of War: History of Weapons in Ancient Times. ISBN 9789386019806. ^ "Thelep.org.uk". Thelep.org.uk. 2008-11-20. Archived from the original on 2012-04-26. Retrieved 2010-09-12. ^ "Wright.edu". Engineering.wright.edu. Retrieved 2010-09-12. ^ "armedieval - le trebuchet et les machines civiles et militaires médiévales". ^ "World Championship Punkin Chunkin – Current World Records". punkinchunkin.com. Retrieved November 20, 2012. ^ "Season 8 Filming: Watch a trebuchet test at Titanic Studios". winteriscoming.net. Retrieved November 8, 2017. ^ Punkin Chunkin 2010- Tired Iron (Youtube) (YouTube). Hancock, NH: The Science Channel. November 24, 2010. Event occurs at 1:17. Retrieved March 7, 2015. ^ RLT Industries. "The Original Floating Arm Trebuchet". Trebuchet.com. New Braunfels, TX. Archived from the original on May 3, 2010. Retrieved May 3, 2010. ^ Syrian opposition use medieval 'trebuchet' to launch bombs. Truthloader. 22 February 2013 – via YouTube. ^ "Ukrainian Protesters Built A Giant Catapult To Fight The Riot Police". BuzzFeed. 20 January 2014. Retrieved 20 January 2014. Chevedden, Paul E.; et al. (July 1995). "The Trebuchet" (PDF). Scientific American: 66–71. Archived from the original (PDF) on 2012-01-11. . Original version. Chevedden, Paul E. (2000). "The Invention of the Counterweight Trebuchet: A Study in Cultural Diffusion". Dumbarton Oaks Papers. 54: 71–116. doi:10.2307/1291833. JSTOR 1291833. Dennis, George (1998). "Byzantine Heavy Artillery: The Helepolis". Greek, Roman, and Byzantine Studies (39). Gravett, Christopher (1990). Medieval Siege Warfare. Osprey Publishing. Hansen, Peter Vemming (April 1992). "Medieval Siege Engines Reconstructed: The Witch with Ropes for Hair". Military Illustrated (47): 15–20. Hansen, Peter Vemming (1992). "Experimental Reconstruction of the Medieval Trebuchet". Acta Archaeologica (63): 189–208. Archived from the original on 2007-04-03. Jahsman, William E.; MTA Associates (2000). 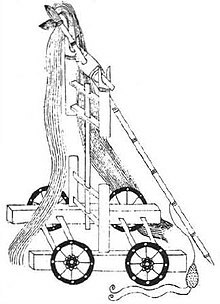 The Counterweighted Trebuchet – an Excellent Example of Applied Retromechanics. Jahsman, William E.; MTA Associates (2001). FATAnalysis (PDF). Janin, Hunt; Carlson, Ursula (10 January 2014). Mercenaries in Medieval and Renaissance Europe. Jefferson, North Carolina: McFarland. ISBN 978-1-4766-1207-2. OCLC 1045562559. Retrieved 30 October 2018. Archbishop of Thessalonike, John I (1979). Miracula S. Demetrii, ed. P. Lemerle, Les plus anciens recueils des miracles de saint Demitrius et la penetration des slaves dans les Balkans. Centre National de la Recherche Scientifique. Liang, Jieming (2006). Chinese Siege Warfare: Mechanical Artillery & Siege Weapons of Antiquity – An Illustrated History. Needham, Joseph (2004). Science and Civilization in China. Cambridge University Press. p. 218. Payne-Gallwey, Sir Ralph (1903). "LVIII The Trebuchet". The Crossbow With a Treatise on the Balista and Catapult of the Ancients and an Appendix on the Catapult, Balista and Turkish Bow (Reprint ed.). pp. 308–315. Siano, Donald B. (November 16, 2013). Trebuchet Mechanics (PDF). Al-Tarsusi (1947). Instruction of the masters on the means of deliverance from disasters in wars. Bodleian MS Hunt. 264. ed. Cahen, Claude, "Un traite d'armurerie compose pour Saladin". Bulletin d'etudes orientales 12 [1947–1948]:103–163. Wikimedia Commons has media related to Trebuchets. Look up trebuchet in Wiktionary, the free dictionary. Wikisource has the text of the 1911 Encyclopædia Britannica article Trébuchet. Super Trebuchets – A website about trebuchets with particular focus on modern uses and developments.